This is another scenario that I had much fun playing. It's designed to be challenging, yet not to hard. 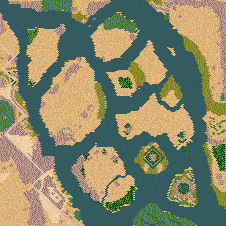 The map mainly consists of islands in a (very) wide part of the Nile. Good to know: Ships enter at the top left corner of the screen, and they leave bottom right. Events are limited; the requests can normally be easily fulfilled. There is no military action in this scenario. Nice mission! I've been staring at the map a long time before beginning to build the first block. Some planning is required. Even if you max out trade, some commodities will be scarce. I needed quite some tweaking to make my 10K peeps meet the mission requirements. The mission feels quite different from most other missions, mainly because of the islands. There's a lot of freedom, without it getting too easy. Nicely done! Thanks for the work you put into this.